This stroke analysis includes a moving sequence in slow motion, a moving sequence where each frame is displayed for .5 of a second, and still frames. The actual frame speed of this sequence is unknown. The time for the 50 m race was 21.92 seconds, a new championship record. Frames #1-3: After entry, the right arm extends fully forward with the shoulder completely elevated (a position of maximum reach). A very rapid flexion of the elbow and outward rotation of the upper arm positions the hand and forearm to provide a propelling surface for forward propulsion. The rapidity of this positioning movement is evidenced by the large drag pocket of turbulence trailing the lower arm and hand in Frame #3. That drag pocket has both a large horizontal and moderate vertical force component contained in the actual resultant force. At the same time as the repositioning, the upper arm commences a slow abduction, which will accelerate at Frame #3. The swimmer is streamlined. As the left arm recovers, the vertical force component it creates forces the head lower in the water, particularly after the right arm diminishes its vertical force component and begins to propulsion. Frames #4-6: Right arm propulsion occurs solely by abduction followed by adduction of the upper arm. The hand, forearm, and upper arm move with almost the same velocity, which adds the upper arm to the propulsive surface. The drag pocket off the upper arm is clearly visible in Frame #5. This maximized propelling surface is a characteristic that is developing in the world's top sprinters. That action still has a vertical force component that causes the shoulders and head to rise slightly. That is why the head is not so visible in these three frames. The body remains streamlined with the hips trailing behind the cross-sectional area of the shoulders. Frames #7-9: Following Frame #6, the right arm begins to extend backward. A productive drag force continues to be created although as the arm begins to angle back relative to the shoulder the propelling surface diminishes to the hand and lower arm. In Frame #9, the hand enters and immediately presses down. The vertical force components of these actions are strong enough to support the head being high in the bow wave, which does not make it easy to see in these pictures. Frames #10-12: As propulsion from the right arm diminishes, the left arm is repositioned to propel. This is an outstanding feature of Alexandre Popov's swimming over the years. He applies continual propulsive force with the arms with only a minor drop of force when the arms "change over." There are no inertial lags (losses of propulsion). The streamlining of the swimmer is yet another very fine characteristic of his technique. The head and shoulders once again appear more clearly as the recovering arm exerts downward vertical pressure and the vertical force component of the propelling arm is diminished in favor of horizontal force. Frames #13-15: The left arm propulsion resembles that of the right arm, although the camera angle makes the left arm look longer than the right. That distortion should be remembered when viewing these pictures. Frame #14 shows the drag pocket of force creation extending from the finger tips to the deltoid muscle of the shoulder. To this stage, there have been no frames that illustrate the kick as performing any other function than counterbalancing arm forces to maintain streamline. No case can be made for the kick providing any propulsion in this sequence. The maintenance of streamline role of the kick contributes more to the swimmer's propulsion than any movement (such as that on a kick board) that would be performed to spuriously "add" to propulsion. Frames #16-18: The left arm provides full propulsion as the right arm recovers. The obvious concentration on developing forward propulsion with the arms while they are in the water is an outstanding feature of this technique. Frame #18 illustrates perfect streamlining. Frames #19-21: As propulsion from the left arm diminishes, the right arm is repositioned to propel. 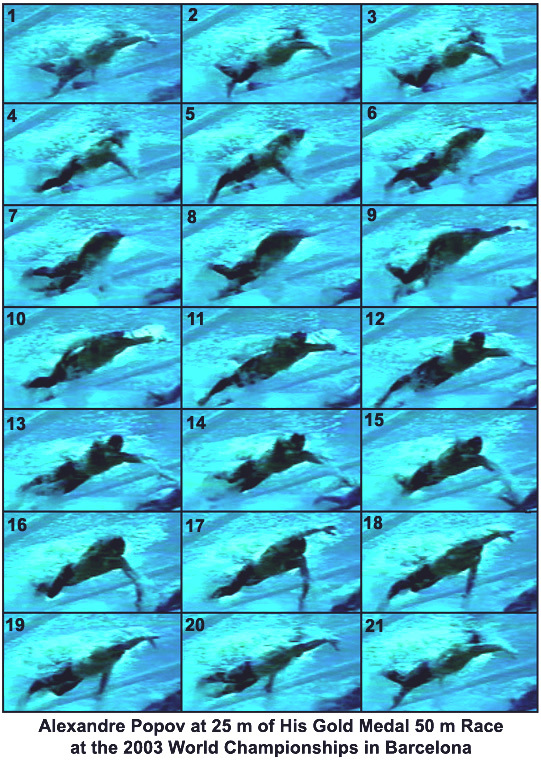 Frames #9 and #21 illustrate that to achieve continual propulsion; both arms have to be in the water with one at the start and the other at the end of developing propulsion. The stroke cycle begins again. The superb technique of Alexandre Popov has qualities that should be emulated by any freestyle swimmer. Continual propulsion, maximized propulsion by using the whole arm to create a very large drag force, and exact streamlining are this swimmer's outstanding technique strengths.